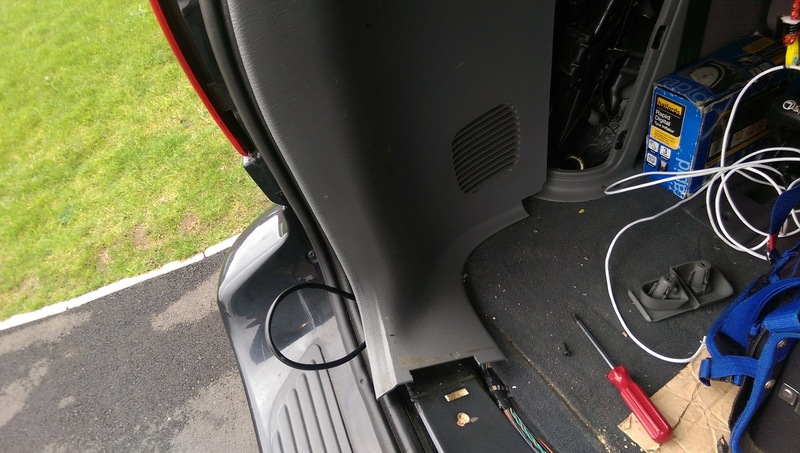 Briefly to complete my installation of the dashcam/reversing camera to my Chrysler Grand Voyager, I wanted to connect up the 12v 'sense' wires that are attached to the rear camera. These will then switch the screen on and set it to reverse mode (the reversing camera full screen), so I set about trying to connect these up. The exterior light cluster on the GV comes out quite easily, two clips and the whole assembly pops out, and again the lights pop out from a clip, I can then see the wiring harness disappear into the chassis, typically further back than I'd hoped, so not within easy reach to any of the edges of the plastic boot covers. So I set about taking the majority of the left-hand plastic covers off. This is additionally difficult as it has the boot opener/closer motor fitted to the chassis, so the plastic covers wouldn't come off completely as I'd need to disconnect the boot motor, which I didn't want to attempt. 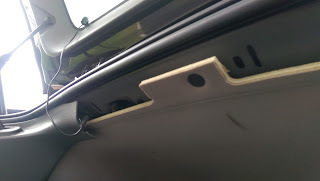 So initially you have to take the boot tray/sill off, which is shown below. Just prise it up from one side as it has metal pop-clips on it, and comes off quite easily. These pop open from the back, and you have to slightly lift when doing that as they sit down onto retaining clips. This is quite tricky, as there are so many parts to this piece of plastic. It's a one-piece that goes from the base of the boot, up around the boot motor, round into the car and contains the rear window motor assembly and also the rear speakers, so quite a large piece of plastic with many shapes and fasteners. I found that this was about as far as I could get, so could just move the plastic around and bend it slightly, just enough to get inside to route the wires and figure out whats going on. I then discovered several odd things. 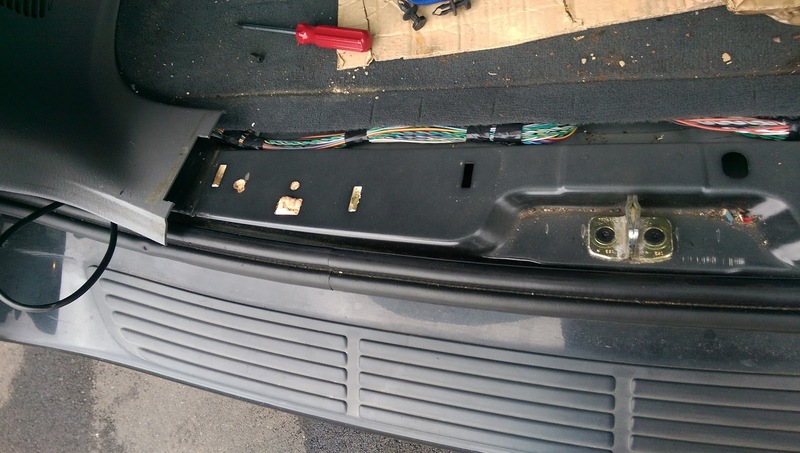 The first was that a control box had been mounted inside the bodywork, and had a whole heap of wires coming out of it. Then, I noticed one of the wires from the main car wiring loom had been cut, extended and then joined into this black control box. The extension wire you can just see on the photo below, it's the red closest on the picture. This had been black-taped at the joins, which always makes me think after-market fitting/work, basically because that's something I'd have done! After continuing with the job in hand, I started to test and trace for the cable connected to reverse lights, and found it's white with a light-green stripe. Sure enough, this is the wire that had been cut and extended as shown in the above photo, so now I know what this box was (probably), reversing sensors. 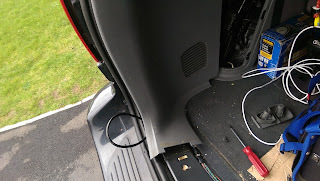 I'd always assumed the reversing sensors on my GV were factory fit, the sensors certainly looked it, and the module was sensibly fitted (It's a small black round circle with about 3 or 4 LEDs from green to red), but perhaps not! So anyway, this meant I could take another branch off this wire and use it for my reverse sense wire. 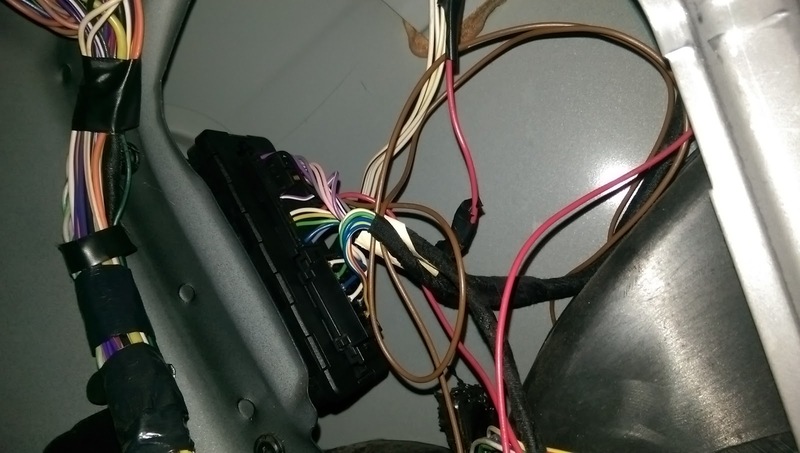 Wiring that in, the system worked great, when I select reverse the camera switches over and displays on the rear view mirror. Web cam technology is now more popular in the world. There are more facilities we can got from Dash Cam Dave and we can keep us safe from any corruption.